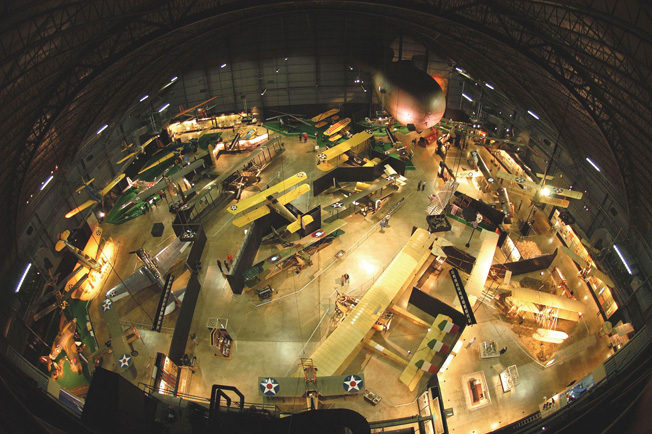 The National Museum of the U.S. Air Force in Dayton, Ohio is the largest aviation museum in the world. 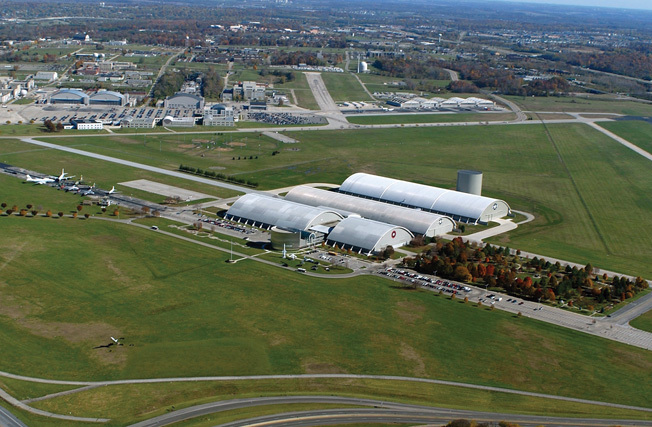 Wright-Patterson Air Force Base in Dayton, Ohio, is home to the National Museum of the United States Air Force––the oldest and largest aviation museum in the world. 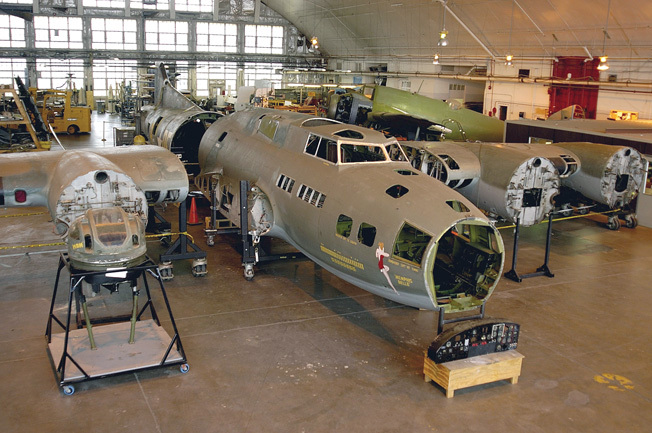 The museum has grown in size and stature over the years, from its humble beginnings in a small corner of one hangar in 1923 to today’s modern, handicapped-accessible facility covering 400 acres. During the past 87 years, the museum has acquired over 69,000 artifacts, and more than 6,000 of them are on public display. With the exception of a few planes on view outdoors, almost everything is prominently displayed inside air-conditioned hangars, including 400 or more aircraft and missiles, personal memorabilia, and items of great historical significance. Visitors are greeted at the entrance to each of the galleries by one of the museum’s very helpful and knowledgeable volunteers. Many of these gentlemen, all of them veterans, have flown or served as crew members on the aircraft that are displayed. Feel free to ask them any questions about the planes and even about their service. Of primary interest to World War II buffs, of course, is the “World War II” gallery. Walking among the assembled warbirds is a humbling experience, and one wishes that each plane could talk. Exhibits start with Pearl Harbor in 1941 and go all the way through the release of atomic bombs in the skies over Japan. Featured in the countless displays are such famed groups as the Flying Tigers, Tuskegee Airmen, and the Doolittle Raiders preparing for their historic strike against Japan in 1942, along with the personal medals of America’s two top aces, Major Richard I. Bong and Major Thomas B. Maguire Jr.
Other WWII aircraft on display include a B-24 Liberator, P-47 Thunderbolt, P-38 Lightning, and a very rare Messerschmitt 262—the world’s first production jet fighter to see combat. The gallery ends with the sobering B-29 “Bock’s Car”—the B-29 that dropped the atomic bomb on Nagasaki in 1945 and brought a swift end to the war. 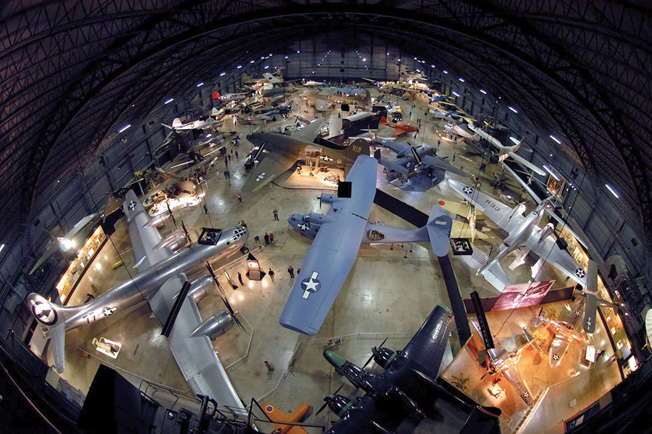 For visitors whose interest in aviation goes beyond World War II, there is even more to see. In “The Early Years” gallery, the roots of aviation are on display—from 18th century balloons to rudimentary examples of powered flight. Restored examples of World War I aircraft such as Spad, DeHavilland, and Fokker are also on view. Be sure to examine the incredible Caproni Ca.36 bomber, the first of many bombers in the museum’s vast collection. Don’t miss the “Between the War Years” gallery, where displays explain such topics as the first attempts at air-to-air refueling, long-distance flights, and General “Billy” Mitchell’s controversial, pioneering efforts to convince the War Department that airplanes could sink battleships at sea. Sleek 1930s racing planes that look like they are still trying to set the next record are also found in this gallery. There are whole hangars that showcase the use of air power during the Korean and Vietnam Wars and the Cold War. America’s leadership in space exploration, too, is on display (plus a collection of Titan I and II, Thor and Jupiter ballistic missiles). Historic presidential aircraft, a tribute to Bob Hope, and a concentration camp memorial are also found on the grounds. An IMAX theater, café, and well-stocked souvenir shop round out the amenities. Obviously, a collection of this magnitude cannot adequately be seen and appreciated in a couple of hours or even a full day. It is recommended that visitors with more than a casual interest in aviation devote at least two days to fully grasp the scope of the collection. 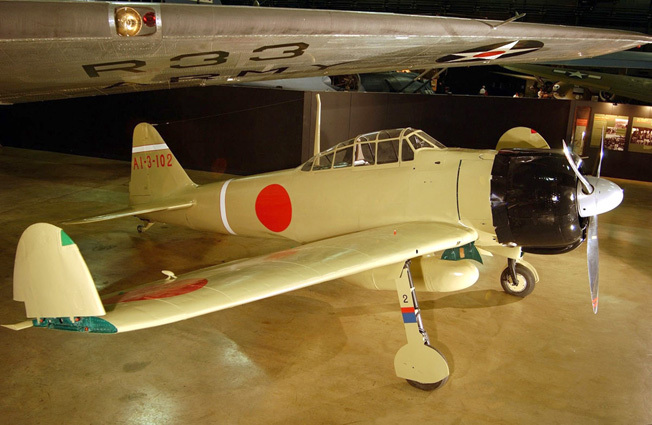 A Mitsubishi A62M Zero is a popular exhibit in the Air Power Gallery. 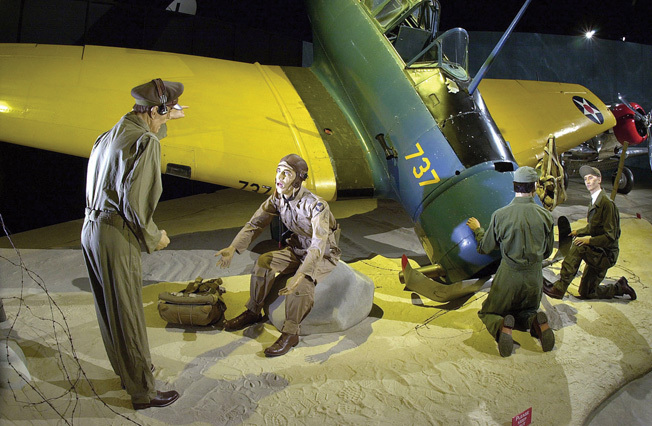 The museum’s Air Power Gallery captures pivotal moments, campaigns, and people of the U.S. Army Air Forces’ air power in both the Pacific and European Theaters. An aerial view of the museum. 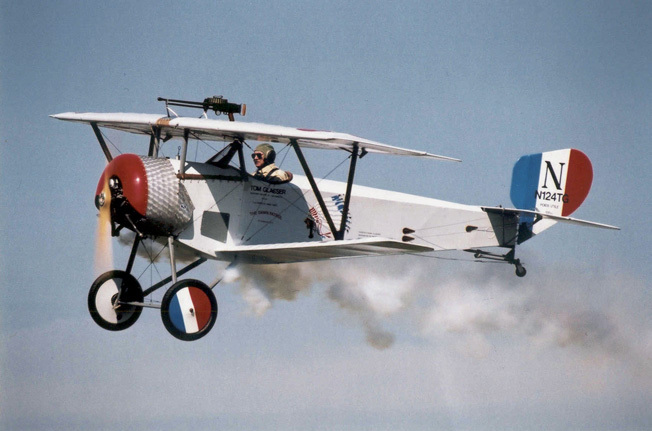 The Dawn Patrol, a World War I Fly-In, takes place every other year. Tags Billy Mitchell, Bob Hope, Boeing B-29 Superfortress, Consolidated B-24 Liberator, Doolittle Raid, Flying Tigers, Korean War, Lockheed P-38 Lightning, Me-262, Nagasaki, Republic P-47 Thunderbolt, Tuskegee Airmen, Vietnam War.